On one day during November I was thinking about doing an interplanetary/small interstellar setting in VBAM based somewhat on my SNE 'Ere The Federation Fractures' supplement. I worked on the idea for a few days before other things (notably my working up of my SUE supplement 'The Nine Benevolent Laws') intervened. My main idea (now I'm looking at these fora) is similar to Charlie's Steel Castles map (which I honestly wasn't thinking off when doing it) but different in other ways. In essence, each planet (be it terrestrial or gas giant) is linked to three 'zone hexes', which are on a large-scale map. There are three 'zones' which have links to their adjacent hexes and specific links to zones further out or in--Inner, Intermediate and Middle. Out from the Middle Zone is a standard hex map which represents the Outer Zone and reaches. This zone would have a simplistic representation of the Kuiper Belt/Oort Cloud by rolling a d6 and, on a 6, having a Raw 0 or Raw 1, Capacity 2 Hostile World. The planets would orbit in their zones at a predetermined rate (some planets would whirl by so quick they'd be in the same place) so allowing for situations where planets might be in prime position to launch an invasion fleet, but later would be on opposite sides of the system primary. I'd worked out approximations of the orbits from 60 days to 5 years (for Inner) and 10 to over 100 years (for Middle). The main idea lay in the display of terrestrial and gas giants. Terrestrial planets would be modeled with Captain-level systems--in essence, one main planet and up to a few moons. Gas Giants would be modeled with Commodore-level systems--allowing multiple moons to be independently colonised. The whole star system would be modeled with Admiral-level system--thus allowing for different planetary orbits. I'm posting this up to try and help either spur some debate or, at the very least, so that I remember to post up again about this. Here's a draft idea. It's not quite as complex as the multiple levels of system generation you suggest, but I think it could make for a challenging strategic gameboard pretty different than the VBAM one, and get some of the ideas you were aiming at in the process. The idea here is that each "planet" has a "Zone 1" which is reachable ONLY from "Zone 2," and "Zone 2" is reachable only from "Zone 3." These could be something along the lines of "Capital City," "Outskirts," and "Orbit". 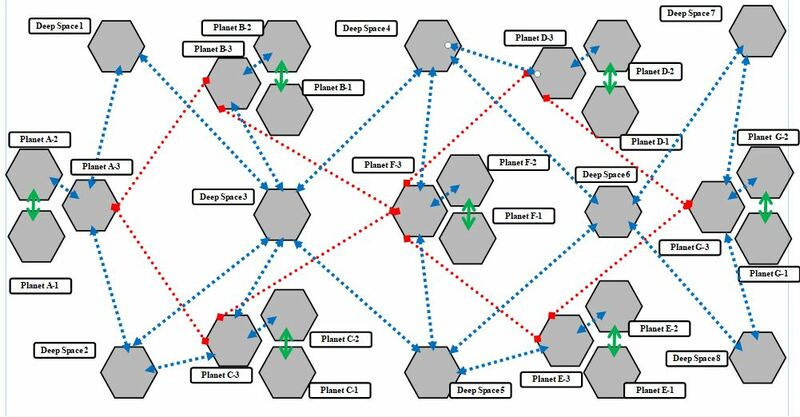 "Zone 3 Orbit" for each planet, is connected to two other planets by restricted lanes - meaning to go directly from Planet A, Orbit to Planet B, Orbit you would need to pre-position in Planet A orbit the turn before and bring supply ships with you. "Zone 3 Orbit" for each planet also connects via a "regular" jump lane to one or two "deep space zones," and those "deep space" zones in turn connect to other planets "Zone 3 Orbit." The arrangement of the planet "Orbital Zones" and the "Deep Space Zones" is meant to create strategic dilemmas. The current map is half-baked, but the idea is that the players might have to try to defend Deep Space 4 to prevent an attack from there on Planet D's Orbital Zone and/or from there to Deep Space 6, which are lightly defended. At the same time, they might be trying to muster an invasion fleet with Supply ships in Planet G's Orbital Zone for a high risk attack directly to Planet E's Orbital Zone. Each zone - Planet A-1, Planet A-2, Planet A-3, Deep Space 1 etc - could be generated by a "standard" VBAM block of statistics (CAP, CEN, RAW, MOR, PROD) with variations - for example, the "Planetary Zone 1" zones could all be high-CAP, low-RAW areas. This would mean the only truly new special rule you might need (I'm a fan of not inventing special rules when not needed) would be one limiting Zone A to only Troop and Flight units or something like that. Anyhow, late evening, quite tired, but I was glad to see some movement on the forums and your idea kicked off a brainstorm and I'm curious what you think. It's good to see some ideas too. I might print it off to allow me to read through it at my leisure rather than a quick read-through the less-than-an-hour at t'library gives me. I read through your proposal last night and it's good, but I don't think it does what I'm looking for for the potential campaign I'm planning. This map is the main map. The document is a collation of all the notes I'd done, most of which are in the maps in the following posts. The document 'Orbital Periods' is the same info as the orbital periods in the document but put into table form. These are the three Inner to Intermediate Approaches options--1 with 3, 1 with 5 and 1 with 6. This is the Inner-Inner Approaches links--including the 'Slingshot' manoeuvre. Wow! That's an amazingly complex map system, and very pretty. The way it fulfills your rules needs is elegant, too. It does seem a little big - in both 2e and Galaxies, my biggest hurdle has always been keeping track of games once they get over 10-12 total occupied systems. To be fair, it's mainly for a campaign where maybe up to ten solar systems are involved (which would be a major campaign at this scale)--I'd envisioned a system that would enable me to game a campaign in the SNE setting I'd mentioned--where there were three systems with multiple sides ruling over parts of the system. Of course, now with the new edition of Unity potentially rolling around my attention has been diverted, so this'll probably lay dormant for a while, but I'm going to make a conscious effort to keep developing this for a VBAM campaign. One interesting approach that I saw in SpaceCorp is to have each movement into an outer zone cost a progressively higher amount to move into. For example it might take 1 Move to travel between areas in the inner system, but it could cost 2 Move to move out towards Mars, or 6 Move to get between areas in the outer system. It would be a way to represent the distances between locations in the solar system without needing to resort to large hex maps. SpaceCorp communicated this to the player by having the map be a set of areas with a number in a circle for each adjacent area that told you how much Move you had to spend to move from one area to the next. In this example graphic, it would cost 2 movement to go from Earth to Mars, but it would cost 7 movement to go from Earth to Jupiter. It's not perfect, but it's another option for handling movement. You could also move the movement costs to the areas/zones to clean up the map in this example. But then you could break a system down into a few different zones, and the movement costs would just get higher as you moved farther out. If you're using Starmada ships, the movement costs can relate to the speed of the ships. So a 6 Engine ship could expend up to 6 movement points per turn to move in system.